Appearance(0-20): Cohiba is a household name that everyoneknows. The Extra Virtuoso was designedto be a full flavored cigar for its product line. The cigar looks great, and well puttogether. The wrapper isn’t oily as someother dark cigars can be, and the band looks nice. As seen in the picture, theband is black with the Cohiba lettering that gives it a boutique look. 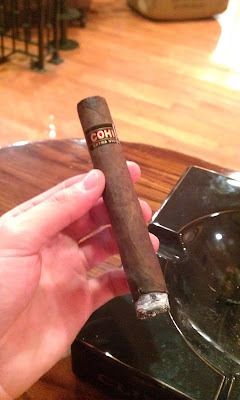 Construction(0-20): The EV was a solid smoke, and definitelya Cohiba product. It feels well packed,and burned so. There were no issuesthroughout the whole smoke, although the ash was a bit flakier than I generallylike. The ash held on and was even as Ismoked it all the way down. No issues onthe draw side either, with respect to how tightly it was packed. Strength(0-20): For being a labeled a full bodiedcigar, I didn’t see this here. When Ismoke a full cigar, I like to feel it about halfway through; this didn’t havethat. It is also promoted to have someligero filler, but the strength wasn’t where it should be for what has beenadvertised. Flavor(0-20): In the flavor department, it seemedto have the same flavor throughout other than the first inch. It starts off with the earth and pepper, butmoves into a earthy-woody flavor through the rest of the stick. There was nothing unenjoyable about it, but Iwas left wanting more. Value(0-20): I got this stick cheaper in asampler pack, but for the $12.50 price point I would say no way. The right price for this stick should be inthe $8.00 range, but Cohiba has the brand power to price things where theywant. AdditionalNotes: No real pairing here, just a fewsips of Gatorade. Smoked at Cigars International. Overall(0-100): Overall, the smoke was enjoyable. I’msomeone who likes to have different and strong flavors throughout, and this didn’tdeliver. If the flavor isn’t there, thenthe strength should be. Pairing thiswith the price point, it’s not something that I would be looking for again.Then again, I would definitely smoke it again if someone handed it to me.